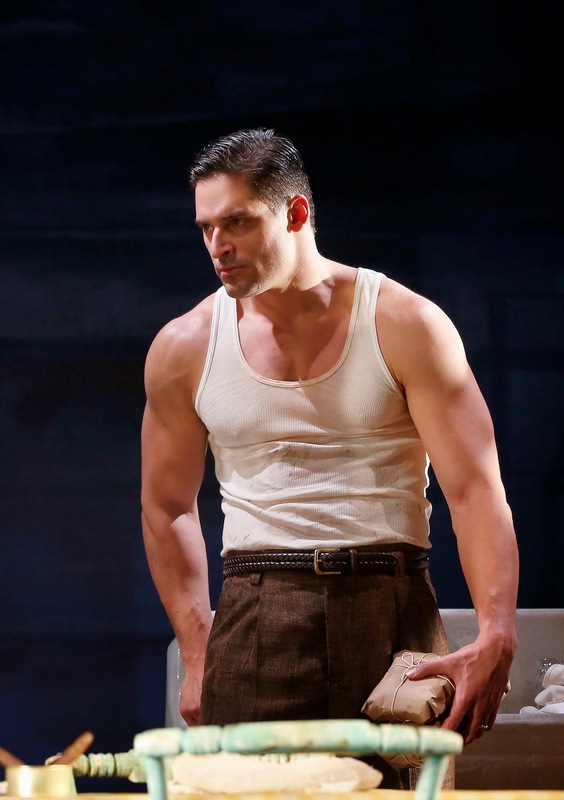 Most productions of Tennessee Williams’ Pulitzer-Prize winning play A Streetcar Named Desire seem to want to focus on Stanley Kowalski, the testosterone-dripping, working class guy whose primal call to his wife became a catch phrase after a wet-T-shirt-clad Marlon Brando bellowed “Stella!, Hey, Stella!” in the 1951 film (reprising the role he originated on Broadway). Since then, good-looking guys like Alec Baldwin, Aidan Quinn and Blair Underwood have been donning (and discarding) their T-shirts and getting most of the headlines when a revival is done. The Yale Repertory show running through Oct. 12 is no exception. Here, there has been media frenzy over the casting of “True Blood” hunk Joe Manganiello in the role of Stanley, but there is a surprise waiting. As directed by Mark Rucker and fueled by a strong performance by Sarah Sokolovic as Stella and a fascinating characterization by Rene Augusen that takes Blanche utra deep, this production ends up being more of a study of the relationship between the sisters. Stanley, despite the display of his very finely chiseled abs and physique several times, seems to have fallen off this streetcar. That’s a welcome development, since this guy, who abuses his wife, rapes his sister in law and is pretty much an all-around louse, really doesn’t need to be the focus of another production. How much more interesting to study why his wife stays with him – desires him in the first place, really -- and discover how she has been able to shed her gentile upbringing to embrace an urban, impoverished world with him. It becomes apparent that raw sexual attraction is mutual in this marriage and a need that makes Stella oblivious to everything else. She long ago abandoned Blanche to the care of their dying parents at Belle Reve, their family plantation in Mississippi and is unaware of (and doesn’t really care about) how Blanche suffered when they lost their home. This Stella is no victim. Fascinating also is the dynamic between the sisters. There is love, forged long ago as young children, mixed with anger and frustration as the women they have become increasingly at odds with each other. Blanche, still living in the gentile world of Belle Reve is repulsed by the Kowalski’s shabby two-room New Orleans apartment and by vulgar Stanley who makes it plain that his sister-in-law is not a welcome addition to their household. Flashback scenes staged behind a scrim (Lighting Design by Stephen Strawbridge) really aren’t necessary, because Augesen takes us there in her characterization. We know how much she misses and craves the kinder days of her youth. · Trying to look beautiful, despite advancing years and a steady drinking habit to woo new beau Mitch (Adam O’Byrne) in the hopes that he will marry her and solve all of her problems. · Covering the intensity of the panic and despair that lies just under the surface and threatens to unhinge her at any second. Augesen’s performance, with its wide range of emotion is the reason to see this Streetcar. Mananiello never seems to fit comfortably into Stanley’s skin (as tight and muscle-bound as it is). He’s too suave and nice to be believable as the mean, crass, working stiff and much of his dialogue, particularly when he is yelling, is lost. Another interesting twist in this production is the number of laughs it gets. Streetcar doesn’t usually come to mind when listing plays that cause chuckles. Not exactly sure what causes the phenomenon here. Perhaps the different focus on the relationship between the women causes some lines of dialogue take on new or more defined meaning. Whatever it is, expect laughter from the audience throughout the play. I kept checking my program to make sure I hadn’t ended up at a comedy by mistake. 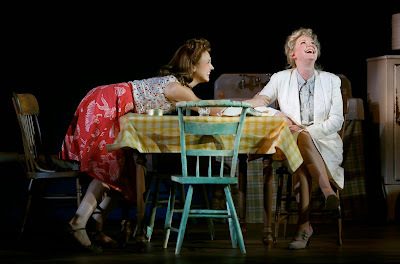 Even with laughs, Streetcar still feels long, however, with its three-hour run time and two intermissions. Reid Thompson designs the set with some puzzling choices. The Hubbell’s apartment is masked by a black drop so that only a small portion of it can be seen from the floor up to a couple of feet. Meanwhile, the whole set shifts a few feet over so that Stanley can have his “Stella!” moment yelling up an outdoor stairway that now is in view on the stage left side of the set. Rounding out the cast are April Matthis and Marc Damon Johnson as Eunice and Steve Hubbell, the Kowalskis’ landlords and upstairs neighbors, and Philip Christian, Nick Erkelens, Ken Ruta and Mercedes Herrero who play a variety of roles. Streetcar plays at the University Theatre, 222 York St., New Haven through Oct. 12. Performance times vary; Tickets $20-$98 yalerep.org; (203) 432-1234; Box Office, 1120 Chapel St. at York Street, New Haven. Student, senior and group rates available.